Move to build ATVs solely in the U.S. is underway with models rolling off the line this month. After a $250 million investment in tooling and assembly line additions, Yamaha has started production of two new 2012 All Terrain Vehicle models in its Newnan, Ga., factory near Atlanta. In February, 2010, the company announced it would be moving all of its ATV production to the U.S. This week's announcement that current production, slated to be on dealer floors by June, is the first of that move. By 2013, Yamaha says it will be building all of its 4WD ATVs in the Georgia facility. 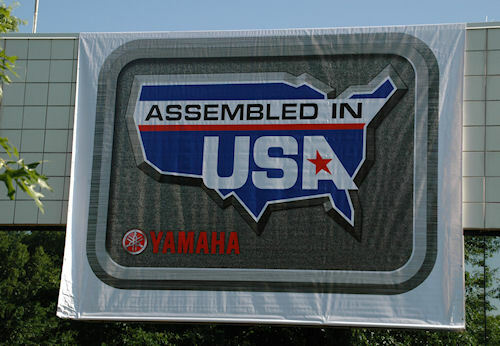 To go with the announcement, Yamaha also unveiled its "Assembled In USA" logo to be displayed on all ATVs coming out of the Georgia facility. Yamaha ATVs will be wearing this Assembled in USA logo beginning with production going on right now at the company's Newnan, Ga., factory. The logo goes along with Yamaha's plan to build all its ATVs in the U.S. -- a project which will be completed by 2013. The Newnan factory, which builds personal watercraft, golf carts and ATVs, currently employs 1,100 workers, and is capable -- under optimum economic and demand conditions -- of employing twice that many. "This production transfer shows Yamaha's commitment to this facility and the U.S. motorsports market -- the world's largest ATV market," said Henio Arcangeli, Jr., Yamaha Motorsports President. "Manufacturing ATVs in Georgia will allow Yamaha to respond more quickly to its customers' demands while streamlining its supply chain and distribution process." Yamaha plans a June 8 unveiling of its 2012 ATVs and Utility vehicles.